This is a dish I made with what I needed to use up in the fridge. Fresh peas, crimini mushrooms and chicken combined with garlic cream sauce and whole grain pasta make a nicely rounded meal. 1 cup pasta water, reserved from cooking the pasta. Cook the pasta following the directions on the box. While the pasta is cooking brown the chicken in a pan with a little butter. Once chicken is brown place the chicken pieces in a bowl and set aside. In the same pan add the rest of the butter and the mushrooms, cook the mushrooms until soft and a little browned. Place the chicken back in the pan with the mushrooms and garlic. stir the garlic through the dish and then add the peas and pasta. stir a little and then add the cream and if needed a little pasta water and 1/3 cup of the cheese. While looking trough food blogs I came across this post of Shrimp Tacos. The tacos looks like a great idea and the fact that is was a quick make made the draw of the recipe even greater. place the dry shrimp in a bowl and sprinkle with the spices then cover with the corn starch, stirring to get a good thin coat on the shrimp then put in a colander and shack off extra corn starch. Heat a cast iron pan, add the oil and then fry the shrimp for about 3 minutes on each side until browned on each side and done trough. remove the shrimp and place on a paper towel lined place to absorb any grease. 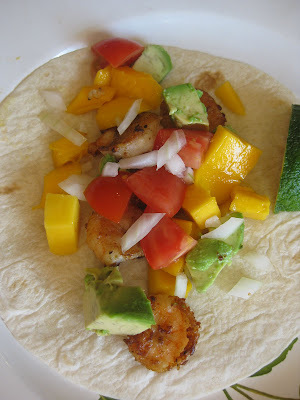 Heat tortilla shells (we like corn) and then place some shrimp and toppings on the tortilla, a squeeze of lime and enjoy.